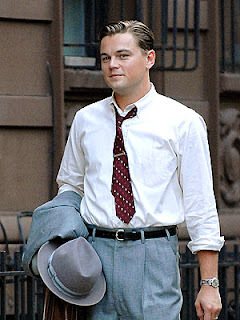 After Revolutionary Road got nominated for so many Golden Globes, I knew that I wanted to see it. When Oscar nominations came out and it didn't get many, I was even more intrigued, wondering what the deal was. Michael Shannon was the only one in the cast to get an Oscar nomination, for his supporting role as the son of real estate agent Kathy Bates, who is currently housed in a mental institution and meets Winslet and DiCaprio's characters while out on day pass. He was excellent in the role, although I can't say that I thought his acting was better than DiCaprio's in this movie, and DiCaprio wasn't nominated. I've only seen one of the nominations for Best Actor, so I can't necessarily say whether DiCaprio deserved a nomination over those actors, but I wouldn't be surprised if that's what I did think even after seeing the five nominated roles. I thought Leonardo DiCaprio was absolutely amazing in this movie. I know that Winslet won a Golden Globe for it, but I was much more impressed with DiCaprio (despite my love for Winslet). In once scene in particular, where DiCaprio and Winslet's characters are fighting about their marriage, his portrayal of a man who is not only enraged, but hurt beyond belief by his wife's words was painful to watch. So realistic and heartbreaking that you almost couldn't believe she was doing it to him. A couple of days after I saw this, my stepdad asked me if it was a good movie. I paused, unable to answer with a quick yes or now. It was good ACTING. Amazing in fact. But I wouldn't call it a good movie. I likened it to Far From Heaven. It's the kind of thing you might watch once, you might think the acting was amazing, but you probably wouldn't want to watch it again. It certainly didn't have a happy ending. The thing is, I have trouble dealing with a movie that has absolutely no redeeming message or occurance. I don't need everything to have a happy ending, but I need it to mean something more to me than despair ending in death or hopelessness or whatever. I need there to be something good SOMEWHERE, and to me, this kind of movie just doesn't have that. I'm glad I saw Winslet and DiCaprio's performances, but other than that I could have left it unwatched and not been worse off for it.